Hanover Engineering was retained by Myerstown Water Authority to oversee the replacement and installation of a variable frequency drive on an existing pump at two of their booster pump stations, the North Locust Street Booster Pump Station and the West Washington Avenue Booster Pump Station, in Jackson Township, Lebanon County. Hanover Engineering consulted with Axiom Engineering Services on the project, and prepared the required contract documents and provided various construction services to assist the Authority. Each booster pump station included four pumps - three 250 GPM pumps and one 50 GPM jockey pump. Two of the 250 GPM pumps were equipped with hydroconstant variable speed fluid drives. 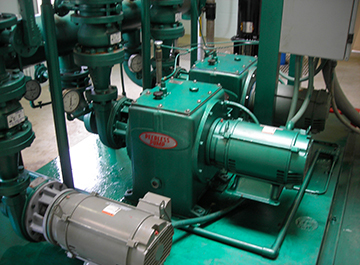 The third 250 GMP pump was not equipped with a variable speed system and when started, would create water hammer conditions with attendant piping system failures. As a result the third, problematic pump was not used, resulting in less than 20 hours of running time, while the remaining pumps had over 10,000 hours of running time. The solution to the problem consisted of the installation of a variable frequency drive to operate and control the problematic pump at each of the two pumping stations. The project also included the installation of the required electrical infrastructure which will be needed in the future in order to replace the hydroconstant variable speed drives on the remaining pumps. Myerstown Water Authority plans to replace the outdated and maintenance intensive hydroconstant drives at the two booster pump stations in a future improvement project.